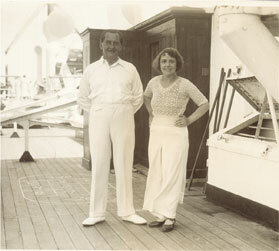 In 1936 Frederick and his wife, Claire, embarked on the maiden voyage of the transatlantic liner, the RMS Queen Mary. The liner symbolised an exciting new era of travel, with function and speed meeting glamour and design. Journeys that would once have been arduous, could now be undertaken in luxurious, stylish comfort. Built as a flagship liner for Cunard, no expense was spared on the Queen Mary’s construction. Leading craftsmen and designers had been commissioned to decorate the ship, and famous artists contributed paintings and sculptures. Over fifty varieties of wood, ranging from oak to walnut and the more unusual betula and zebrano, were used in the liner’s magnificent pannelling and pillars. 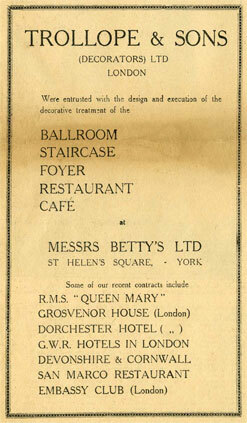 When he returned home, Frederick started to plan for his most ambitious and glamourous branch to date – a flagship café in the spirit of the Queen Mary in the landlocked location of St Helen’s Square, York. The interiors were inspired by the elegant Art Deco style of the Queen Mary. Frederick even hired the firm of London designers and craftsmen who had worked on the transatlantic liner to create his new branch. Exactly a year after he and Claire had arrived in New York, the new branch opened for business. Still today our York tea room is home to many Art Deco features – particularly the first floor Belmont Room which was originally the main café. These include elaborate brass grilles on the doors and etched glass panels depicting trees and mountains. There is also a marquetry panel depicting geese flying across a lake, a recreation of one that appears in a stateroom on board the Queen Mary.